Helping with the proof reading of this wonderful book before it becomes ready for sale. It is amazing. I am so grateful to have the blessing of helping with the proof reading of one of my hero’s. Uncle Billy! 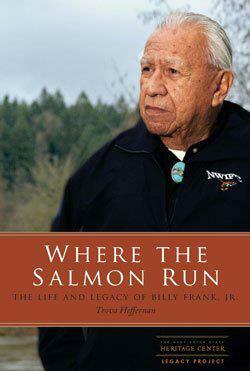 A Legacy Project biography of Northwest Indian activist, Billy Frank, Jr. Please complete the form below to be notified when Where the Salmon Run: The Life and Legacy of Billy Frank, Jr. goes on sale. This entry was posted in Raven views and tagged Billy Frank Jr., First Nation, First Peoples, Fish Wars, Hank Adams, Human Rights, Indigenous, Jr, Make No Bones About It, Northwest Indian Fisheries Commission, Robert Satiacum Sr., Where the Salmon Run: The Life and Legacy of Billy Frank. Bookmark the permalink.